A man and his teenage daughter travel to an alien moon with a contract to mine gems in the moon's poisonous forest. The daughter is forced to face other people in the forest, as well as her own father's greed. Prospect premiered on March 5, 2018 at the 2018 South by Southwest Film Festival, where it won the Adam Yauch Hörnblowér Award. The company Gunpowder and Sky, under their label Dust, released the film in Regal Cinemas theaters on November 2, 2018. The film was released on video-on-demand and home media on March 8, 2019. The review aggregator website Rotten Tomatoes assessed 38 reviews; it reported 34 as positive and 4 as negative, for an overall rating of 89%. It reported an average rating of 7.08/10. The website's critical consensus reads, "Fueled by character development and setting instead of special effects, Prospect is a sci-fi story whose style is defined—and enriched—by its limitations." On Metacritic the film has a weighted average score of 68 out of 100 based on reviews from 8 critics, indicating "generally favorable reviews". 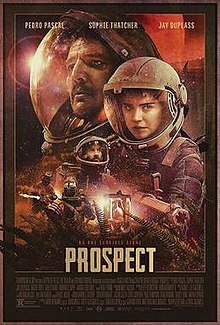 ^ a b "Prospect (2018)". Rotten Tomatoes. Retrieved November 11, 2018. ^ McNary, Dave (September 17, 2018). "Pedro Pascal's 'Prospect' to Launch in Theaters From Sci-Fi Dust Label (Exclusive)". Variety. Retrieved September 21, 2018. Chen, David (March 7, 2019). "How to Design a Good Sci-Fi Space Helmet: An Interview With the Filmmakers of 'Prospect'". SlashFilm. Retrieved March 8, 2019. ^ "Prospect Reviews". Metacritic. Retrieved November 11, 2018. This page was last edited on 7 April 2019, at 22:40 (UTC).